All of the centers are done, and half of the blocks are completely finished. I started some dishcloths using Knit Picks Dishie. This project is easier to work on when I'm riding in the car for quick trips. The colors are, from left, Pomegranate, Azure, Mulberry. (Azure is also the one I'm currently knitting.) The pattern is Grandmother's Favorite, free on Ravelry. For Joanie's birthday, I promised to finish piecing her Pine Tree Quilt top. I spent an afternoon at her house. Here's a photo of the layout she chose. The sashing is the fabric under the blocks, and the fabric to the right will be a 3" border. (For scale, the blocks will be 7" finished and the sashing 1" finished.) The fabric at the bottom is the backing. I had to leave about 4:00 PM, so I'll have to have another session, but I have the top two rows of blocks sewn together and the rows sewn. The bottom two rows of blocks are sewn together, and the other two sashing rows are sew. The cornerstones will be the same fabric as the sashing, and Joanie plans to embroider wild grasses over the cornerstones. Vintage Stitchers met on Thursday at Rebecca's. Brenda has been busy since we saw her last. She has finished several quilt tops. This is her machine-embroidered Halloween Quilt. She pieced this top at a quilt retreat recently. Brenda has had these fabrics for some time. Here is another machine-embroidery project, this one using patterns from Bird Brain Designs. Rebecca had finished this cross-stitch for her daughter. Remember her Christmas quilt? She inherited most of the blocks from a friend who passed away a few years ago. She finished the quilt, adding her own special touches. Now it's done, and what a great tribute to her friend. She has several quilts to piece for gifts, so she's making 1600 quilts. Here's the first one, ready to have quilted. Janet had finished piecing this quilt top, which was part of a "Route 66" BOM. She will probably add borders. As for life at home, the first real snow of the season has arrived. This was just the beginning. Stay warm, everyone, and watch out for ice. What's on my needles: Hand-quilting the Delectable Pathways, knitting the Trickle Brick Socks and dishcloths. What's on my Featherweight: Kaleidoscope Quilt. What's on my iPad/iPhone: Finished Darken the Stars. Now listening to Georgette Heyer's Beauvallet. (I love her books. They're so full of humor, adventure and romance.) Still reading Three Silver Doves by Deborah Garn on the Kindle app. What's in my wine glass: Glen Ellen's Reserve Cabernet Sauvignon 2013 vintage. Nice and fruity. What's my tip of the week: For hand-quilting, thread your needle before cutting it from the spool. Let that end be the short one, and your thread won't tangle. No thread treatment (such as beeswax) needed. Carol Ann: Birdfeeder? Roxann, we've had lots more snow, and cold temps. The power company shut off our power (for repairs, I guess) for the whole day today. I twisted my hip doing laundry yesterday and can hardly walk today, and DH went to work, but he supplied me with lots of firewood first and got the fire started before he left. Barb, I have to say I'm enjoying the Kaleidoscope quilt. Hope to get back to it today. Too bad my Featherweight needs electricity to work. 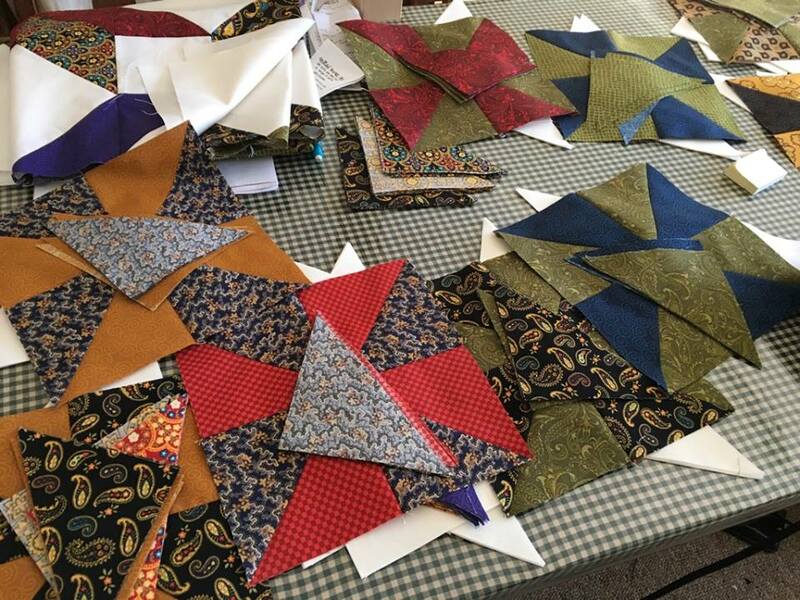 Your kaleidoscope quilt is is going to be great! Dish cloths are one of the few things I actually do knit, and I love having yarn ready for car trips. So many beautiful quilts again. Love all the embroidery, and the Winter cross stitch is beautiful. Interesting tip again. All of the quilts are gorgeous! I'm jealous of the embroidered ones. I am always drawn to embroidery, I have just never tried it. We are suppose to get snow Sat., I'd rather we didn't. If it's below 70 I'm freezing all the time!!! Stay safe and warm! "Bird Brain Designs" rang a bell with me. I have visited their little store in Kelseyville after attending a quilt show in Lake County last year. If you are into cute little embroidery designs and wool applique, that's the place to go. I didn't realize they were digitized for embroidery machines, though. They also have a collection of charming farm antiques; I was attracted to a little old fashioned tin chick feeder, and almost added it to my purchases, but not sure what I would have done with it! No chickens here! It's Brenda's, but I agree. Brenda and Marilyn are prolific machine embroidered. Rebecca's embroidery machine was working overtime. Beautiful projects! Keep that snow out west! Yes, Carol Ann. We're getting it now. Thanks! YVW, Rebecca. Thanks for the link to the pattern Peggy. I've printed it out and put it in my 'to do' pattern collection. Your snowfall went through our mountain house area near Lassen Volcanic Park on Sunday! A beautiful 4" to 6" at 5,000 ft. It's on it's way to Utah!